You may have noticed, beautiful clerics, that brown is everywhere this year. You got yer brown pants, you got your brown shirts, you got yer brown boots, you got yer brown bags and brown sweaters and brown coats!! With all this brown around, PeaceBang, a brown-eyed girl, wants to say a few words about this color. 1. Brown can be lush and gorgeous, or brown can be blah. Be careful how you use brown. 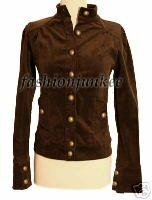 This is a lovely brown jacket. Men, I'm sure there's a nifty version of this garment for you somewhere at Macy's or the like. It's a rich brown, like the pelt of a cute animal like a beaver or otter, it has terrific bronze buttons, it's fun. You can throw an interesting, long, nubby scarf around the neck and wear it out anywhere with beautiful jeans and wonderful boots. The lady, she is so downcast! Por que? Because she did not take PeaceBang's advice to choose luxe brown pieces and she is just looking very blah in her brown sweater. The color is dead, it has no richness to it, and even though she is very pretty and slim and has shiny hair, her complexion and her demeanor are dragging because of this poopy garment. Brown is fabulous, my darlings! But not all brown is fabulous. Choose it wisely and well, in interesting, rich fabrics that capture light and that don't just mope around like a dried out peach pit on the kitchen counter. If you have a dull complexion and hair and refuse to wear make-up, avoid the brown. The brown, it will do you and your people no good. The brown, it can be a curse. Or it can be a blessing. a great deep teal looks awesome with brown. gold looks great with brown. green, expecially blue greens, or a springy green with some yellow, look great with brown. try a magenta pink if you can't stand baby pink. stipes of pink and brown would be good. Try wacky stuff and see what happens! How about black with brown? I think that can look smashing! It can, as long as there's some verve in the outfit. Two flat pieces without any texture or accessories would just seem like someone didn't realize they were mismatched. Which can also happen with two different shades of black..
You inspired me, PB! Just went out and bought a yummy chocolate brown blazer and a fun chocolate brown burnout flared skirt. Redheads (like me) are often drawn to brown. I have learned to resist my impulse to be Earthtone Guy -- Mrs Philocrites has caught me more than once putting on brown trousers and a green sweater -- but that usually means I end up wearing blue and black. While on the subject of brown, it should be noted that those of us who are on the darker end of the human color spectrum must be really careful about browns, as most of them don't match us really well. Just like any color though, the brown depends on whether it's a cool brown or a warm brown. If you are a cool-based color person, that warm-based color is never going to work. PeaceBang, you are unbelievably fantastic. And I personally love brown with red. A Few Tips Following a Cursory Glance at "Lucky"